Hey guys! 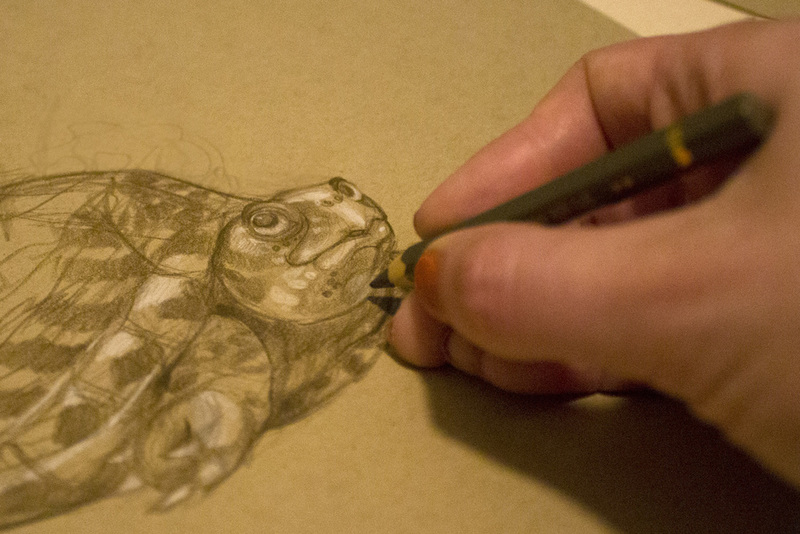 I wanted to show a few of the drawings I have been doing in the special edition sketchbooks. There are just a few left, and they can be purchased in our shop. 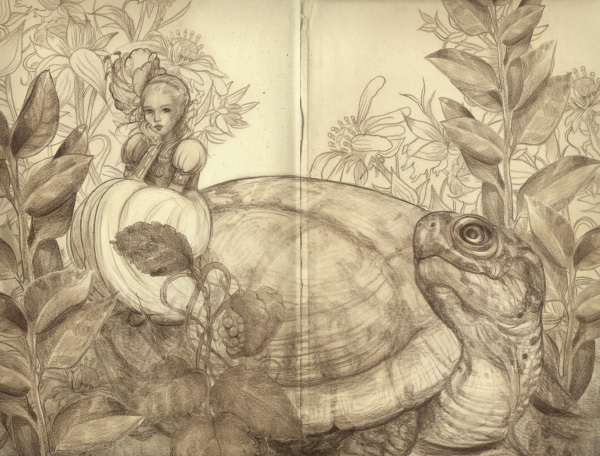 My new 2014 sketchbooks on is now available in the Gallery Gerard shop! The first 300 books will be signed and numbered. We will also be offering a limited edition package that comes with an original drawing in the front, as well as a limited edition mini print. Hey guys! I was recently commissioned to do a portrait of Galadriel for a private collector. I had a lot of fun with this one, and was really able to loose myself in all of that foliage! For me, it can be very therapeutic to spend time on the tiny details. We are finally back from FaerieCon West in Seattle, WA. This weekend was our first time showing as guest artists at this event and our first time showing at a convention as a married couple (woo!). Unlike our regular show modus operandi, we packed everything for our booth in some checked and carry on bags, and hopped on a plane. We were both a little nervous about flying with original artwork, so our booth was, unfortunately, a bit limited. We only brought prints and books to this show. Despite this, we had a blast at the show! We were able to participate in some fun panels, hang out with friends and family, and eat lots and lots of food. The beautiful sunset view from our room! 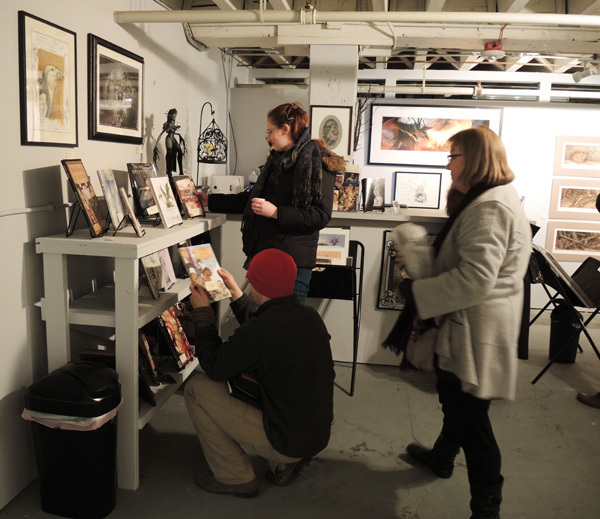 Krab Jab Studio had a room at the event to show off the latest pieces from their new exhibition, Faerie II. You can see all pieces from the show in their studio until February 27th. There were some great images taken from the opening of this show via Tara Larsen Chang. It's been a long time, but I am finally starting to work on new pieces for the Thumbelina collection. I've been excited to work on this image in particular. The imagery in Hans Christian Anderson's passage is so beautiful. I began working on this piece last year, but became discouraged with the size and decided to repaint it a little larger this time around. Thumbelina would have probably ended up being actual size if I stuck with the original dimensions! It was a hard decision, because I liked the underpainting I had started for it. And also because... who wants to completely repaint something over again once you have already started!? I almost abandoned the new piece a dozen different times during the first few days. But in the end, I think I'm happy I decided to start over. The good news is that because I had a value study to use as reference, I was able to begin painting immediately with color on the new one, which sped things up a lot. I hope to get some of the depth back with glazing once these layers have dried. And to tone down the green. I also happened to stumble upon some great mossy patches in the mountains last weekend and was able to get a few reference photos. I am really excited to see what I can incorporate into this. I'll post some more updates soon! This coming February we will have some paintings in Seattle's Krab Jab Studio show, Faerie II. The show will run from February 8th-27th 2014. I begin with a rough pencil thumbnail to get an idea of what the composition of the piece will be. A digital color mock is created to determine mood and basic lighting. A final sketch is created after all preliminary work is completed. 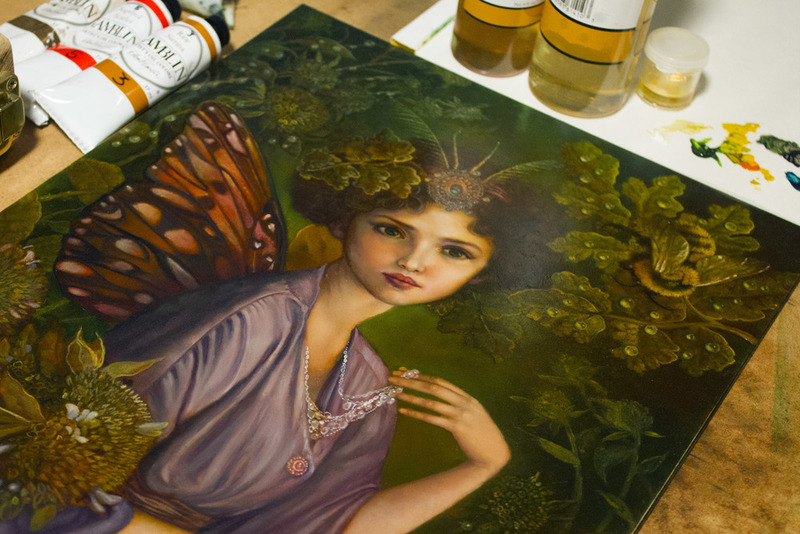 The colors are applied in oils with glazing. The color is built up over many glazes to create the atmosphere of the piece. Once there was a fairy named Calida, who was very beautiful. Calida was a very energetic fairy, who, like most fairies, did not love to work. Instead, she loved to dance, and she loved music, and most of all, she loved her mother. It was Calida’s most wonderful and favorite possession. One night Calida heard a nightbird’s song. “What a beautiful melody!” she said to her friends. Then a joy began to overtake her and her little feet began to wiggle. Then her little knees began to wiggle. Then her whole body began to wiggle and she couldn’t help it; she had to dance. And she and her friends leapt from among the cold clover and danced among the tall flowers. They danced and danced far into the night. They did not care that it had grown dark, all they cared about was the music. It became so dark in fact, that they couldn’t even see. Then, as the night came to a close, the dancing finally came to an end. The first rays of the morning began to break through the trees. And they all saw that it was true! It was no where to be seen. Calida never found her diamond, made from a star; but she still searches for it each night. And if you watch for her, just before sunrise in the forest, you can see her tiny figure, as she goes out and opens each flower in the forest, one at a time, to look for her lost diamond. I have exciting news to share! My husband and I have joined artistic forces and created a new website which will showcase both of our works. We plan on having live and online demos, holding contests to win original artwork, and will be launching a new online store in February which will showcase original drawings and sketches. 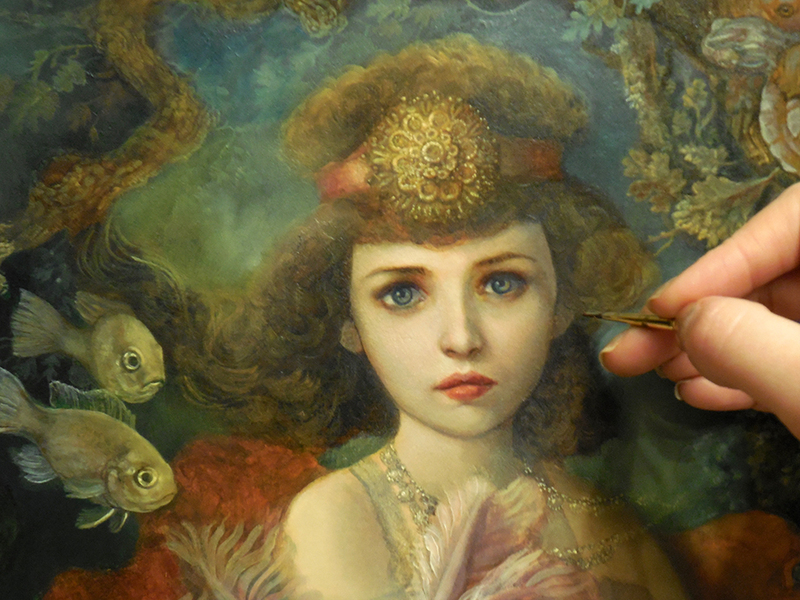 Also, I wanted to post a quick update of a new oil painting I am working on for the Faerie II show at Krab Jab Studios. The studio is in a little bit of a disaster right now. Now that I am sharing a space with my talented husband, Justin, what once was a perfect working situation for one seems cramped now! To start the new year off right, we have been renovating and organizing the whole thing. While I am excited to have a better working space, the whole room has been unusable for the past month. Thankfully, a space was cleared the other day and I have had a little time to work on my Mudpuppy painting. 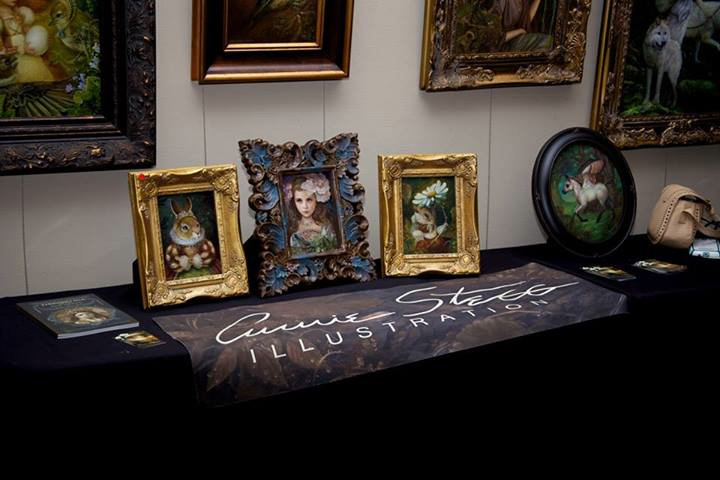 A wonderful photo of my mini IlluXCon paintings courtesy of Jeannie Wilshire. I also shipped out Thumbelina sketchbook orders last week. Here is a preview of the sketches I have been drawing in the limited edition books so far. Each book get its very own original character, and they have been a ton of fun to work on! Sketchbook Release Today at 11am EST! 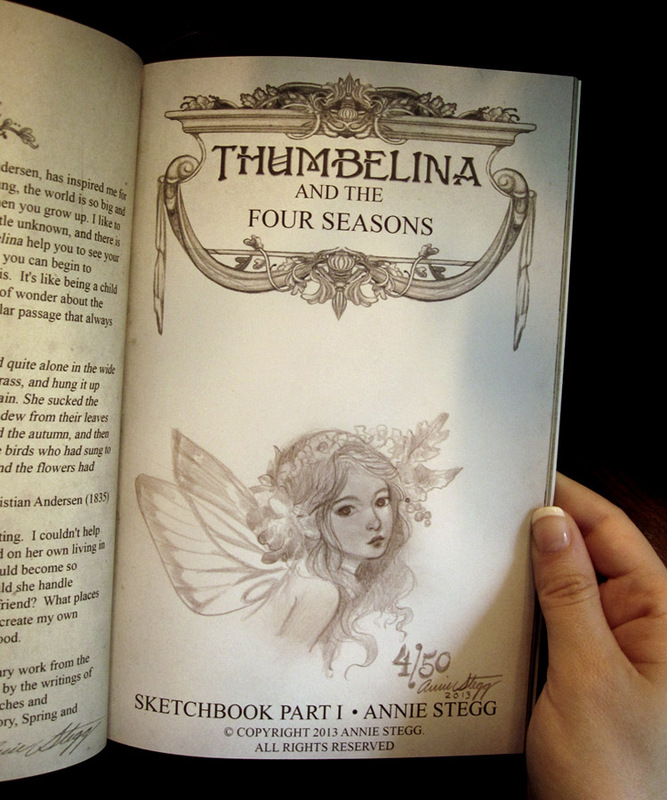 Thumbelina and the Four Seasons Sketchbook will be available for purchase TODAY at 11am EST on my etsy. I will have 2 versions available. 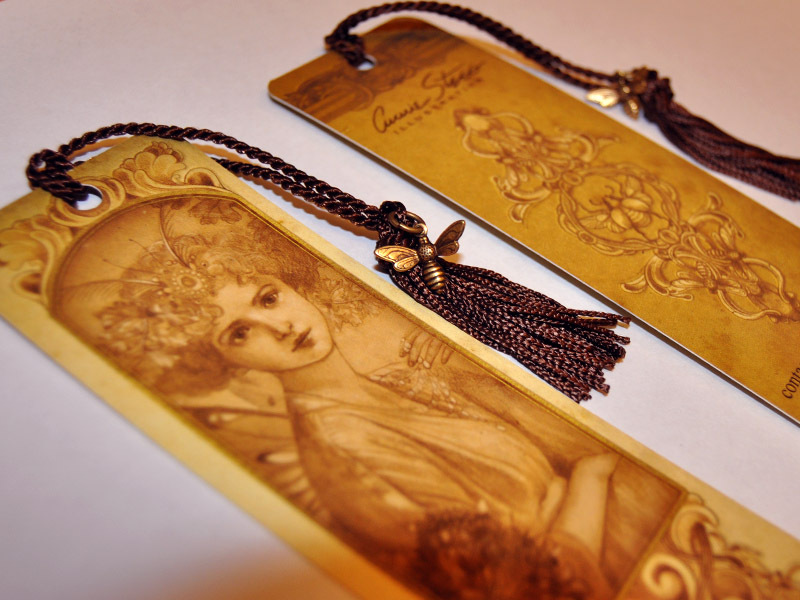 Limited Edition Bundle: One book, signed and numbered (1-50) , a tasseled bee charm bookmark, and a hand drawn image on the title page for $40. There will only be 50 of these books available, and it will be first come first serve basis. 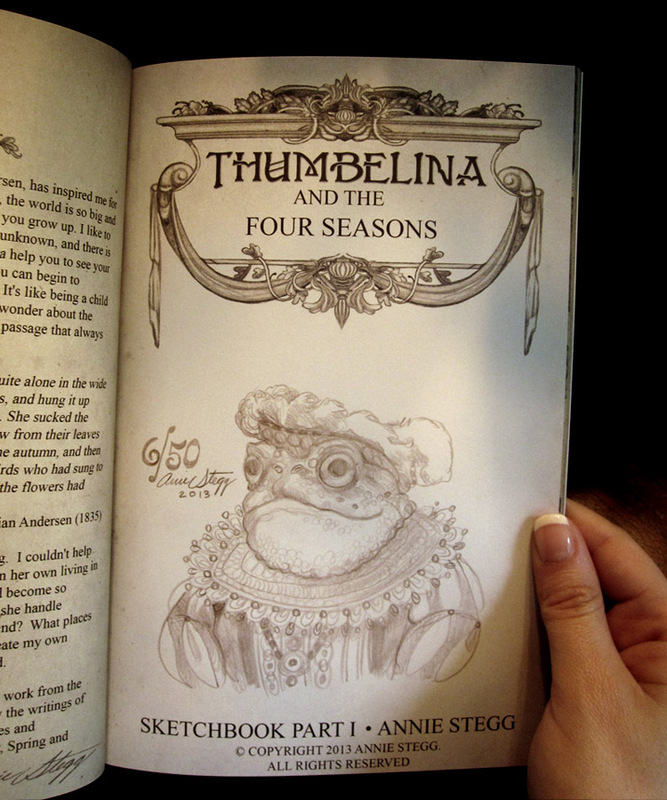 Thumbelina and the Four Seasons Sketchbook will be available for purchase on Tuesday, September 10th, at 11am EST on my etsy. I will have 2 versions available. I will be posting more images on my etsy shop when it is available. 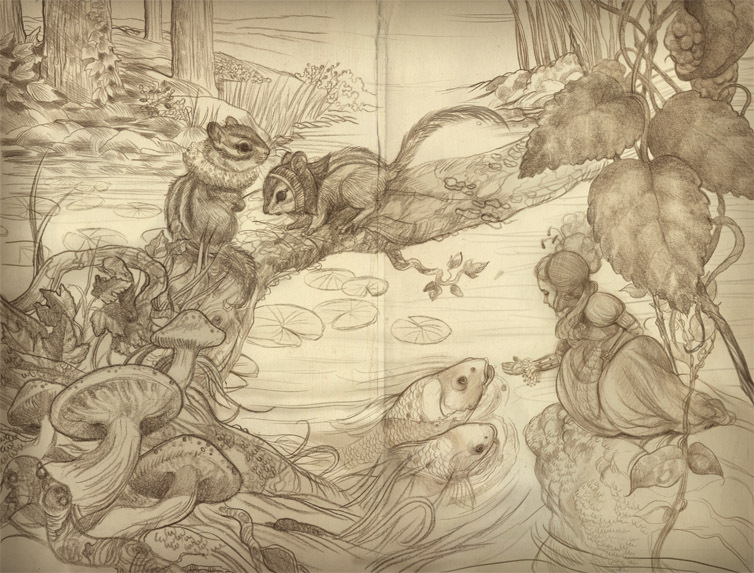 Be sure to also check out Justin Gerard's etsy. He will be releasing his beautiful sketchbook the same day/time! I will be in the DragonCon 2013 art show this Friday, August 30th. Here is a map to my booth, in the Grand Hall West of the Hyatt Regency Atlanta Hotel. Annie and Justin demonstrate how to create an illustrated scene from initial thumbnail to final brushstrokes. A round-table art discussion with fantasy artists. I will be bringing lots of new art, so be sure to stop by my booth, the printshop, or my table! I will have sketchbooks, bookmarks, prints, originals, and limited edition giclees. Guess what came in! The proof of my sketchbook has arrived, and the final copy was sent to the printers yesterday. I will have purchasing details just as soon as the books are shipped to me. I am excited to announce a project that I have been working on over the last year. Later this month I will be releasing a collection of preliminary work from my Thumbelina series, inspired by the writings of Hans Christian Andersen. The images will include sketches and underpaintings from the first part of the series, and will be bound into a softcover book.The book will be 38 pages, and include over 50 working images that have been my initial steps in creating the collection of existing paintings, as well as future images. Here are a few sneak peeks of some new paintings from the series! I am happy to announce that the latest special edition Imagine FX is on sale now! 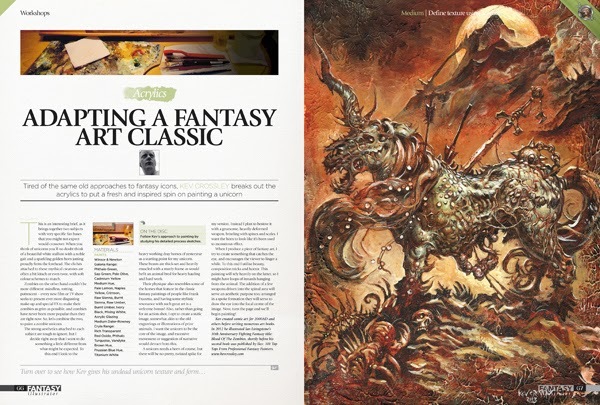 In this issue I demonstrate how I created The Faerie Queen, step by step using both photos and video footage. ImagineFX Presents Fantasy Illustrator is a collection of traditional art tutorials from some of the leading fantasy artists around the world. Learn to paint in oils, acrylics and watercolour. Use Copic markers and sculpt in Super Sculpey. Tutorials include Cynthia Sheppard loosely painting a character from Game of Thrones, Kev Crossley paints a textured zombie unicorn, Annie Stegg dips into her Rococo influences to paint a faerie while Wayne Haag reveals how he controls light in his sci-fi seen. In total, there are 14 new tutorials from artists as varied as Terryl Whitlatch and Anthony Palumbo, who paints our issue's cover. 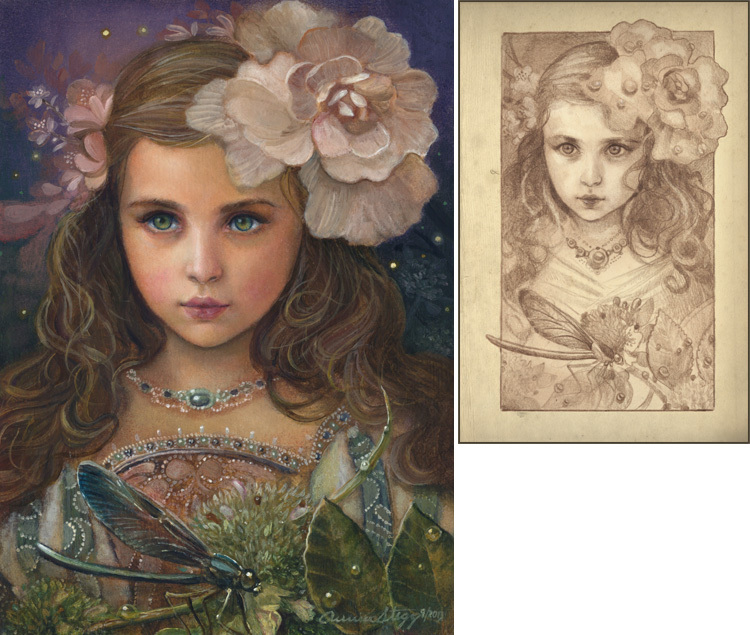 For beginners, there's Terese Nielsen's core skills masterclass where she reveals quick tips on everything from mounting paper for painting to making lines in ink and pencil, as well as blending in pastels and taking your first steps in watercolours. Finally, the issue comes with a free disc of tutorial content that includes the final art plus video of Anthony Palumbo, Annie Stegg, Erik Jones, Aaron Miller and Cynthia Sheppard hard at work! Fantasy Illustrator is also available on the Apple Newsstand (inside the ImagineFX app). Coming soon to Zinio. Only a little bit of pencil left! 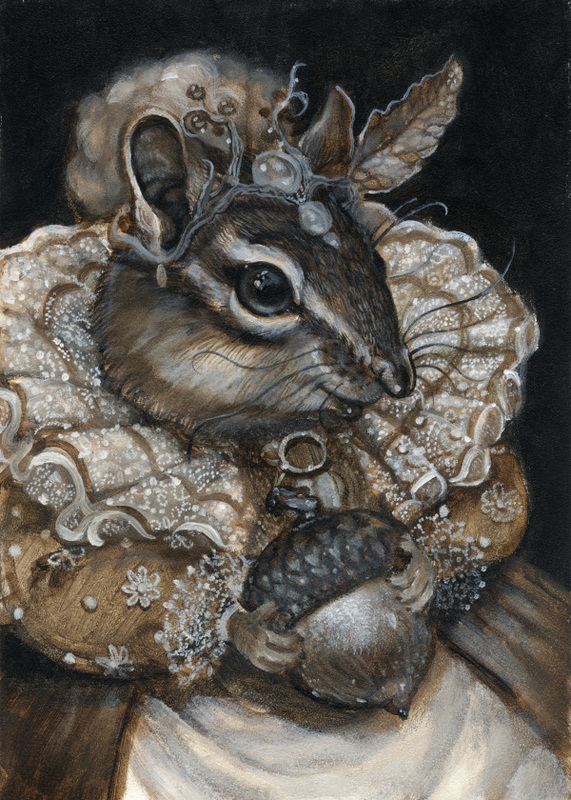 Here is a sneak peek of another piece for the Thumbelina collection: The Duchess of Oak Nut. I will be illustrating the Duke next. JG: So speaking of your work, you are currently working on a series of paintings based on Hans Christian Anderson's Thumbelina fairy tale. Can you tell us a bit more about that? AS: I have wanted to do a series on this fairy tale for a while now. The reason I like Thumbelina has largely to do with the magic and mystery of childhood. When we are young, the world is so big and magical and I think you lose some of that when you grow up. I like to imagine a place where everything is still a little unknown, and there is so much left to discover. Stories like Thumbelina help you to see your own commonplace world with fresh eyes and you can begin to appreciate just how amazing the world really is again. It's like being a child again in many ways, and capturing that sense of wonder about the world around us.